Chicago-based artist, and Los Angeles native, Marqueal Jordan is the rare musician who is blessed with the gift of being equally proficient as an instrumentalist and a vocalist. His distinctive saxophone tone and style, combined with his soulful vocals, places him in the tradition of legendary dual talents, Donny Hathaway and George Benson. Marqueal (pronounced Mar-KWELL) is intent on following in the footsteps of these giants on his upcoming debut CD, “Catalyst”. 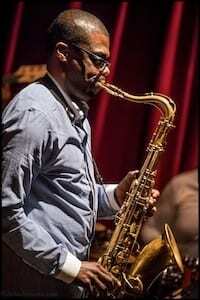 Described by fellow saxophonist Mike Phillips as “one of the most versatile saxophonists in the game today”, Marqueal earned his reputation as an electrifying live performer after moving to Chicago in 1995. He was the front man for the Chicago-based funk unit, Fat Time, and became an integral member in numerous Jazz, R&B and Blues bands in the city. In 2008, Smooth Jazz star Brian Culbertson asked Marqueal to join his touring band and for five years he captivated audiences around the world with his talents. As a sideman, he’s performed with an amazing list of major artists such as Oleta Adams, Gerald Albright, Patti Austin, Average White Band, Rick Braun, Jonathan Butler, Stanley Clarke, George Duke, Aretha Franklin, Larry Graham, Lalah Hathaway, Al Jarreau, Earl Klugh, Dave Koz, Jeff Lorber, Maysa, Najee, Ray Parker, Jr., Phil Perry, David Sanborn, Sinbad, Gerald Veasley, and Kirk Whalum. Marqueal is featured on Brian Culbertson’s DVD, “Live from the Inside”; and also on a current collaborative CD with Chicago legend, DJ INC, entitled “Sounds Cool”. Dusty Groove America touts Marqueal’s playing on “Sounds Cool” as “a 21st Century update of the Stanley Turrentine ethos at CTI.” Marqueal is also featured on New York-based pianist Mark Adams’s CD, “Love And Dance”; Chicago keyboardist William Kurk’s DVD, “Live In Chicago”; and, bassist Donald Alford II’s CD, “Dream Movement”. Marqueal’s solo debut CD, “Catalyst”, is scheduled for release in 2013. Oleta Adams, Gerald Albright, Patti Austin, Average White Band, Rick Braun, Jonathan Butler, Stanley Clarke, George Duke, Aretha Franklin, Larry Graham, Lalah Hathaway, Al Jarreau, Earl Klugh, Dave Koz, Jeff Lorber, Maysa, Najee, Ray Parker, Jr., Phil Perry, David Sanborn, Sinbad, Gerald Veasley, Kirk Whalum, Mindi Abair, Donald Alford II, Avant, Walter Beasley, David Benoit, Tim Bowman, Peabo Bryson, Nick Collione, Eric Darius, Will Downing, Candy Dulfer, Von Freeman, Savion Glover, Wycliffe Gordon, Noel Gourdin, Chris Greene, Buddy Guy, Niki Haris, KRS-ONE, William Kurk, L’Renee, Kenny Lattimore, Chuck Loeb, Mike Manson, Eric Marienthal, Mike Phillips, Carol Riddick, Chris Rob, Eric Roberson, Greg Spero, Spur Of The Moment, Avery Sunshine, U-Nam, Kevin Whalum, and Corey Wilkes.